In case you’ve been living in a cave in Wakanda, tomorrow is the premiere of Marvel’s Avengers: Infinity War movie. Super-fans can celebrate with new Avengers iPhone cases from OtterBox. These feature characters from Marvel’s highly anticipated movie, including Iron Man, Black Panther, Captain America and Thanos. Plus, there’s one that combines multiple images from this blockbuster superhero team-up flick. 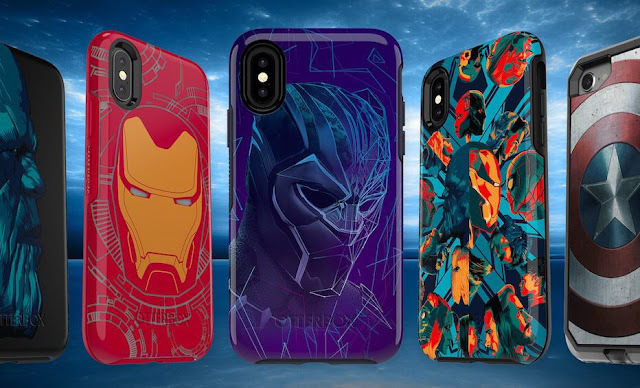 OtterBox designed the Marvel-themed cases from its Symmetry Series to protect the iPhone from “bumps and drops” while maintaining a slim shape. A raised beveled edge guards the touchscreen. The Avengers cases fit iPhone X, iPhone 8 and 8 Plus, and iPhone 7 and 7 Plus. Some of these designs stand out. The Iron Man case from this series is OtterBox’s first ever glow-in-the-dark offering. The one featuring Thanos features matte and gloss effects intended to give a 3-D effect. The Captain America case is the only one from OtterBox’s Defender Series. It’s much more rugged, including a shell with a rigid exterior and flexible interior for drop protection. The exterior also blocks out dust, dirt and grime. Sounds more like Iron Man than Cap, though. This Defender case isn’t available for the iPhone X. You can order Avengers: Infinity War iPhone cases from the OtterBox website now. They list for between and $45 and $60, but right now OtterBox is offering 20 percent off most of its iPhone cases. OtterBox has been getting into licensing lately. The company recently introduced iPhone cases for Solo: A Star Wars Story.